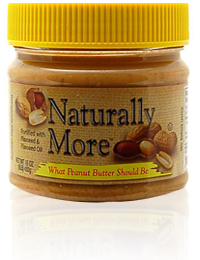 Naturally More is a brand that makes both peanut butter and almond butter, but better. They make “What Peanut Butter/Almond Butter Should Be!”, meaning these nut butters are enhanced with special goodies to keep you healthy, but at the same time are still all natural and delicious. For the Organic Naturally More peanut butter, it is higher in protein, higher in fiber, and lower in fat than standard peanut butter. It also contains no trans fats, is fortified with flaxseed and flax oil, and has no other additives. 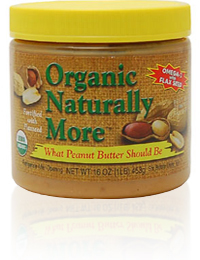 I was super excited when I recieved this in the mail from Naturally More as we all know how much I adore peanut butter- this one HAD to be a winner! Honestly- the company had me fooled. Tastes like good ol’ peanut butter to me. Creamy and just slightly sweet, it has a nice, peanutty flavor. Perfect for PB&J’s, peanut butter & bananas, and one of my favorites, spread of a slice of organic chocolate cake (*drool*). What is different about this peanut butter is that there are itty-bitty flaxseeds in it, so it has a bit of crunch to it. Different-yes. Weird- a little, but I liked it. It was sort of like eating crunchy peanut butter, but without the HUGE peanut chunks. Overall, I give this peanut buttah’ 5 stars. I love that it’s organic, high in fiber & protein, and even lower in fat & calories than regular peanut butter. Absolutely delicious, and it is now in rotation with my other favorite plain peanut butter, Smuckers All Natural Peanut Butter. I have over 30 jars of nut butters at my house, but sometimes I just want good ol’ PEANUT BUTTER- no iffs, ands, or butts. This one is definitely in rotation now! 1 serving (2 tbsp) is 170 calories, 11 grams of fat, 8 carbohydrates, 4 grams of fiber and 9 grams of protein. Organic Peanuts, Organic Flax Seed, Organic Dehydrated Cane Juice. <— yay for short ingredient lists!